Does Bancassurance Reduce the Price of Financial Service Products? I assess the impact of bancassurance on the price of retail financial services. 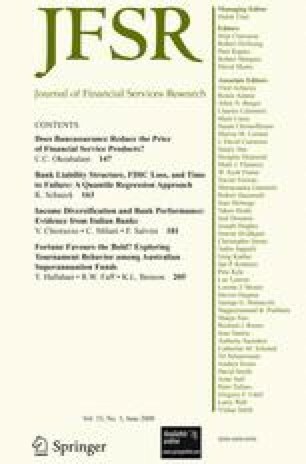 I find that service fees in a product bundle increase less than proportionally to the number of services; that an increase in the number of clients in each product bundle market reduces fees by 1.5%; that the degree of competition in the markets of each bundle also reduces fees; that premium products have higher average costs; and finally, that cross-holdings reduce prices by about 5% and bancassurance reduces prices by just over 6%. The price reduction declines if both strategies are combined. This paper is part of the Southern Africa Financial Institutions Industry Structure (SAFIIS) Project funded under BARDA-Grant 017/2002–2008. I am grateful for the comments of participants at the SAFIIS Workshop, Johannesburg 21–22 June 2006. I wish to acknowledge Econometrix (Pty) Ltd, South Africa for allowing me access to their Sector Star, Econosnaps, and Finance Monitor database products. I am grateful for the research assistance of John Mang’ana, and to Fabian Ogbonna and Bongiwe Kanzi for their efforts in the cleaning and cross-validation of the data. Finally, I wish to thank the Editor, Stijn Claessens, and an anonymous reviewer for his/her insightful comments. The usual disclaimers apply.